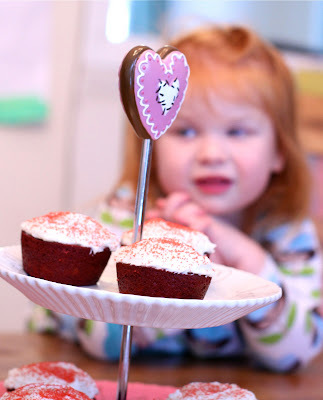 If you're up for some weekend baking in preparation for Valentine's Day on Monday, you MUST make these!! They are super moist unlike other "from scratch" cake recipes I have tried! The recipe is simple and fairly quick to throw together. The perfect Valentine's Day treat! Prep Ahead Plan: Make the cupcakes and frosting up to a day ahead of time. Store the frosting in the fridge and frost the cupcakes as needed or immediately before serving! Getting pictures of the finished product is almost always a challenge! Little grabby fingers are usually waiting in the wings ready to pounce. It's really hard to say no to that sweet little, "Pweeeeeease???" 1. Preheat oven to 350 degrees. Mix flour, cocoa powder, baking soda and salt in medium bowl. 2. Beat butter and sugar in a large bowl for about 5 minutes or until light and fluffy. Beat in eggs, one at a time. Mix in sour cream, buttermilk (or soured milk), food coloring and vanilla. Gradually beat in flour mixture on low speed until just blended. Be careful not to over-beat! Spoon batter into greased or paper lined muffin cups, filling each cup 2/3 full. 3. Bake 20 to 25 minutes or until toothpick inserted into cupcake comes out clean. Cool and frost with vanilla cream cheese frosting before serving. 4. Vanilla Cream Cheese Frosting: Beat cream cheese, softened, butter, sour cream and vanilla in a large bowl until light and fluffy. Gradually beat in confectioners' sugar until smooth. Perfect, I needed a cupcake recipe for tomorrow! Oh great! 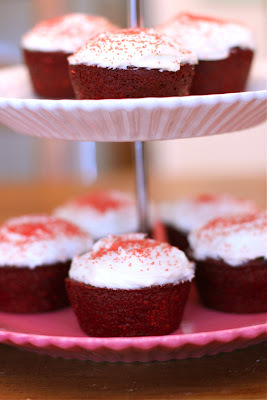 I think this might be my favorite cupcake recipe yet! So yummy! Hope you like them! Copyright © PrepAhead and Dine In: red velvet cupcakes with cream cheese frosting for my favorite little valentines. All Rights Reserved.